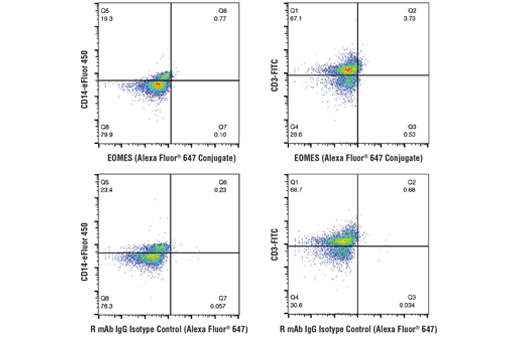 Flow cytometric analysis of human peripheral blood mononuclear cells, co-stained with a CD14 antibody (left) or a CD3 antibody (right), using EOMES (D8D1R) Rabbit mAb (Alexa Fluor® 647 Conjugate) (top row) or concentration-matched Rabbit (DA1E) mAb IgG XP® Isotype Control (Alexa Fluor® 647 Conjugate) #2985 (bottom row). Flow cytometric analysis of RPMI 8226 cells (blue) and NK-92 cells (green) using EOMES (D8D1R) Rabbit mAb (Alexa Fluor® 647 Conjugate) (solid lines) or a concentration-matched Rabbit (DA1E) mAb IgG XP® Isotype Control (Alexa Fluor® 647 Conjugate) #2985 (dashed lines). 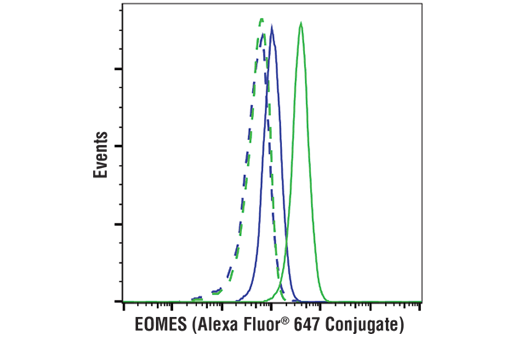 EOMES (D8D1R) Rabbit mAb (Alexa Fluor® 647 Conjugate) recognizes endogenous levels of total EOMES protein. Monoclonal antibody is produced by immunizing animals with a synthetic peptide corresponding to residues surrounding Pro180 of human EOMES protein. This Cell Signaling Technology antibody is conjugated to Alexa Fluor® 647 fluorescent dye and tested in-house for direct flow cytometric analysis in human cells. This antibody is expected to exhibit the same species cross-reactivity as the unconjugated EOMES (D8D1R) Rabbit mAb #81493. The T-box family of transcription factors is named for their shared homology with the DNA binding domain of the mouse brachyury (T) gene product. Members of this family bind DNA and are capable of transcriptional activation. They also have evolutionarily conserved expression patterns and roles in embryonic development, primarily mesoderm development (1). EOMES, or Tbr2 (T-box brain 2), is a master regulator of mesoderm formation that is also essential for trophoblast formation, gastrulation, neurogenesis and the differentiation of certain T cell subsets. Embryos from EOMES knock-out mice die soon after implantation due to their inability to develop a trophoblast (2,3). Conditional neural knock out mice show defects in development of a specific population of neural progenators known as Intermediate Progenator Cells (IPCs) that give rise only to neurons (4,5). These cells are formed from the radial glia in the ventricular and sub-ventricular zones of the cortex. Expression of EOMES increases as cells develop from radial glia to IPCs and then decreases as IPCs progress to neurons. Recent evidence suggests that EOMES and IPCs may also play a role neurogenesis in the adult hippocampal SGZ (5). EOMES is also a key transcription factor for memory T cells and for full effector differentiation of CD8+ T cells (6). Expression of EOMES is induced in CD8+ T cells following viral infection and bacterial infection where sufficient IL-12 has been produced to elicit acute host cell response (7). Showell, C. et al. (2004) Dev Dyn 229, 201-18. Russ, A.P. et al. (2000) Nature 404, 95-9. Strumpf, D. et al. (2005) Development 132, 2093-102. Englund, C. et al. (2005) J Neurosci 25, 247-51. Hodge, R.D. et al. (2008) J Neurosci 28, 3707-17. Takayanagi, M. et al. (2003) Rheumatol Int 23, 315-8. Takemoto, N. et al. (2006) J Immunol 177, 7515-9.